ProMMAnow.com (www.prommanow.com) reporter Anton Skoro recently caught up with MMA legend and former UFC light heavyweight champ Quinton “Rampage” Jackson (32-10) who was in Las Vegas for the SEMA Auto Show. 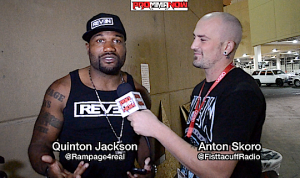 Rampage shared his thoughts on fatherhood and the difference between “Rampage” the fighter and Quinton Jackson. He also talked about dressing up as Batman for Halloween and how much fun he had driving around in his lime green Lamborghini dressed as Batman. Rampage also explained why he did not want to coach The Ultimate Fighter opposite Chael Sonnen. He would not however give any insight as to what organization he would like to fight with after the UFC — which is probably a smart thing at this point. As he mentioned in the video, you can check out Rampage’s clothing company REVEN at http://reven100.com and follow Rampage on Twitter and on Instagram @Rampage4real. To stay up to the minute with all our interviews and MMA news, be sure to subscribe to ProMMAnow.com’s Youtube channel, follow us on Twitter @PROMMA and Like us on Facebook at Facebook.com/ProMMAnow.